Most of us associate collagen with its critical role in skin rejuvenation, but collagen actually serves many other essential functions in the body. This is why a multi-collagen protein supplement offers so many unexpected benefits and enviable results. Your skin may be soft and forgiving, but collagen itself, gram-for-gram, can be stronger than steel! It’s no wonder that multi-collagen protein is emerging as a powerful and natural supplement to boost the body’s health and reverse unwanted signs of aging. Collagen is the most abundant protein in your body. You already know that collagen keeps your skin looking youthful and radiant, but did you also know that collagen protects your organs, provides structure to joints, and works like super glue to keep your bones and muscles together? It’s true; collagen is a building block necessary for life itself. Though at least 16 types of collagen exist in the human body, 90 percent of that collagen is categorized as type I, II, and III. Type I and III collagen are very similar. They both support strong hair, skin, nails, and bones. Type II collagen makes up 50% of all protein in cartilage. It functions as the lubricant between all the moving parts in your joints, the same way as grease does in the engine of a car. Why Is Collagen Protein Important? Many body processes slow as we get older, including the metabolic processes required to produce collagen. In fact, your body’s collagen supply declines steadily after the age of 21. Other unhealthy habits, such as eating a high-sugar diet, smoking, and exposing your bare skin to harsh ultraviolet rays, also damage collagen proteins. Without sufficient collagen levels and healthy collagen proteins, everything from your blood vessels and tendons to your skin and nails becomes more fragile. Reduced levels of collagen type II also diminish lubrication between the joints, which could be why your joints feel increasingly sore, creaky, and swollen with age. What Are the Benefits of Multi-Collagen Protein? Fortunately, the effects of lost collagen can be reversed using a multi-collagen protein supplement. The best multi-collagen protein includes five types of collagen from four natural food sources to support ongoing skin, joint, and gut health. Low collagen levels cause skin to lose elasticity and suppleness. This is why your skin might look increasingly lax, dry, and wrinkled as you age. Type I collagen is the powerful protein capable of supporting skin cell renewal over time. Thanks to collagen’s natural ability to promote vibrant skin, just 5 grams of collagen hydrolysate a day can dramatically improve the texture, hydration, and elasticity of your skin. Multi-collagen protein also restores plumpness to skin tissue in order to minimize the appearance of cellulite and stretch marks. This is exactly why multi-collagen protein is like a fountain of youth in a bottle. It automatically addresses every significant esthetic anti-aging concern that men and women have! If your nails are dry, brittle, and peeling, it’s highly likely that you’re low in collagen. Thin and brittle hair often becomes noticeable for the same reason. Without sufficient collagen levels, your hair and nails cannot sustain their natural strength. Research clearly shows the power of multi-collagen protein to restore growth rate and integrity to your hair and nails. One study found that daily supplementation with collagen peptides helped to boost fingernail growth by 12% and reduced the frequency of broken nails by 42%. Other evidence suggests that collagen supplementation can boost hair growth and improve shine, thickness, and strength. 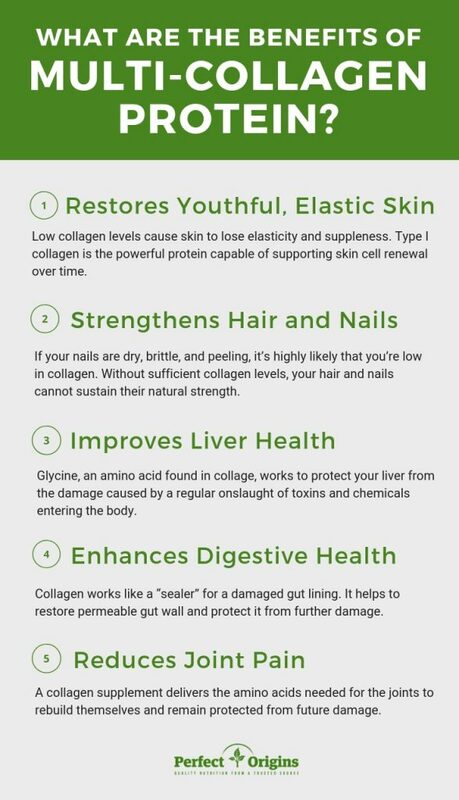 One of the most important components of collagen is glycine, the amino acid that works like a shield to protect your liver from the damage caused by a regular onslaught of toxins and chemicals entering the body. Our modern diet, busy lifestyle and city environment is full of these toxins — chemicals in our food, pesticides, pathogens, alcohol, UV rays, stress. These can all harm the liver, particularly as we get older. Since the liver is the ‘central processing unit’ for all our detoxification pathways, it needs to be protected and supported. Studies have shown that regular intake of glycine through multi-collagen protein can help to reduce damage to the liver caused by alcohol and other forms of acute or chronic injury. Collagen restores the nutrients and amino acids that your body needs to improve digestion. Collagen draws water and stomach acid through the GI tract to alleviate constipation. Collagen works like a “sealer” for a damaged gut lining. It helps to restore permeable gut wall and protect it from further damage. This is especially important if you suffer from leaky gut syndrome, irritable bowel disease, or Crohn’s. Furthermore, collagen is also a hydrophilic molecule, which means it has an attraction to water and acid molecules. 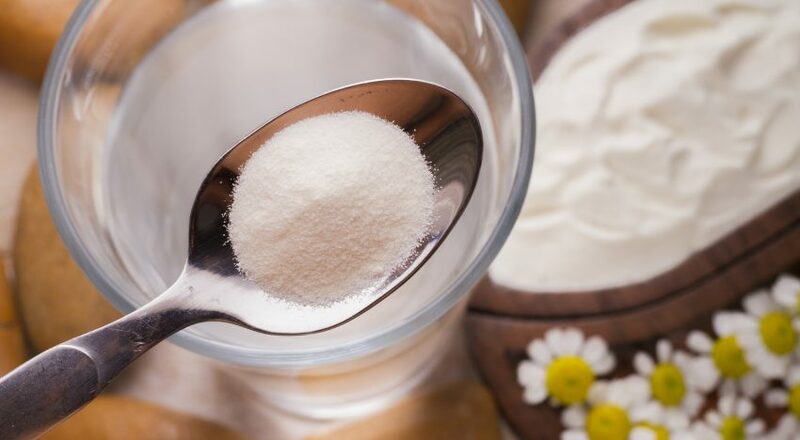 When taken as an oral supplement — that is, as a food — collagen acts like a kind of sponge in the intestines, drawing in both water and stomach acid as it moves through the gastrointestinal tract. If you are prone to constipation or sluggish digestive function, a multi-collagen protein supplement will help to keep your bowel movements regular and easier to pass. 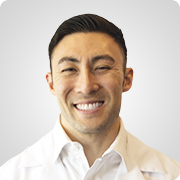 More than a quarter of the United States population suffers from chronic joint pain, but research shows that multi-collagen protein supplementation can prevent and reverse the impacts of collagen loss by improving joint health. A collagen supplement delivers the amino acids needed for the joints to rebuild themselves and remain protected from future damage. In fact, research shows that collagen hydrolysate supports joint fluidity, reduces cartilage deterioration, and minimizes pain over time. When used correctly, multi-collagen protein has the power to transform your physical health, improve your quality of life, and stop signs of aging in their tracks. 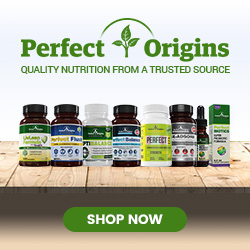 Perfect Origins’ TBM Multi-Collagen Protein stands out from all other collagen supplements because it is made from five unique types of pure, natural collagen. The combination of grass-fed beef, free range chicken, wild-caught fish, and eggshells provides the necessary building blocks to help you achieve your health and weight loss goals. Multi-collagen protein should be used two times per day. Try one scoop in the morning and one scoop in the evening, added to 8 ounces of water, coffee, tea, or a smoothie. Since it took years for your body to begin showing the effects of decreased collagen production, you can’t expect your multi-collagen protein supplement to trigger improvements instantly. As long as you continue collagen use twice a day, you will see distinct changes develop within two to three months. Due to the cumulative effects of aging, sun damage, and lifestyle habits, your body’s collagen is breaking down at an accelerated rate. The only way to replace this collagen and protect the integrity of your skin, hair, nails, and joints is to supplement with multi-collagen protein. Along with a healthy diet and lifestyle, multi-collagen protein will help you preserve your youth, vitality, and sense of wellness. The Perfect Origins Multi-Collagen Protein offers the superior-quality collagen you need to enjoy so many benefits for years to come.